Thank You for Your Interest in My Group Mining Projects! I am very happy that you are considering spending time on one of my joint mining ventures during the upcoming season. I have scheduled one week-long above-water project for the upcoming season, and four week-long dredging projects. Each project is 7 days long. Each is a separate project. Because of limited space in these projects, it is essential that you reserve a position on the project of your choice as early as possible. Above Water Project: This is an exciting opportunity to help find and recover gold deposits that are located outside of the active waterway. We will begin by going into areas where there is a strong likelihood that we will find high-grade gold deposits. Sometimes these deposits are found inside bedrock cracks along the bank of the river. Sometimes, high-grade gold is found in the contact zones between the dry streambed layers up on the bank. Our mission for the week-long project will be to prospect different areas until we find a deposit rich enough to develop for its gold values. We will be prospecting with digging tools, gold pans, and perhaps vack-mining gear. Once we find the deposit(s) we are looking for, we will organize a plan to develop the deposit(s) so we can recover as much of the gold as possible in the remaining time of the project. Likely, that will involve bringing some motorized sluicing machines into the action. We struck a high-banking production record during a recent above-water Project! Dredging Projects: These dredging projects are for people who desire to experience the thrill of recovering high-grade gold deposits located at the bottom of the existing waterways. We will be primarily using 5-inch, 6-inch and 8-inch dredges during these dredging projects. Less-experienced participants will have the option to start using a 4-inch dredge (with hookah air). No prior experience in dredging or diving is necessary. But if you have serious phobias about sticking your head underwater, or are deathly afraid of the water, I advise you to think it over carefully before you decide to participate in the dredging program. Perhaps an above-water project is better suited to your needs. Should you decide to participate, be assured that I will help you to go underwater and help you understand what to do, as long as you are willing. The places we choose to prospect with dredges will pretty-much be geared to the abilities of our participants. We will all have to remain a bit flexible on this part, since there will be multiple individuals involved, and our abilities will vary. We will have enough dredges available to keep everyone busy. 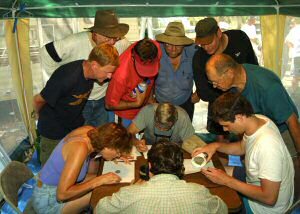 We can plan to allow the more experienced people prospect out into the deeper, faster-water areas, while less-experienced participants can prospect the easier areas (where pay-streaks are found just as often). We will have to sample it all, anyway. We will accommodate the needs of everyone while doing a good job looking for the rich deposits. We will work as a team, taking turns on the suction nozzles. Do not fear; there is plenty of other work involved to keep the program moving along. Sometimes, we will be winching boulders out of the way. Sometimes, the water is shallow enough that others can help to move cobbles out of the way. 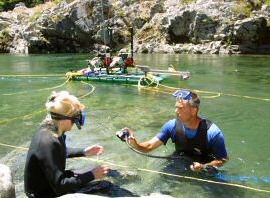 Everyone on the team will gain more experience in proper dredging and gold recovery techniques. We will be moving the dredges around until we find the gold deposit(s) that we are looking for. Then, we will invest the remainder of the week developing the gold deposit(s) to recover as much gold as we can get in the time remaining. All the gold we find during a 7-day project will be accumulated and split equally amongst each of the project-participants. You will need to obtain a California suction-dredge permit only if you want to operate the suction nozzles of the dredges we will use on the project. A dredge license for 2007 cost $42.50 for California residents (have lived in California for at least the past 6 months), or $167.25 for non-residents. Permit fees usually go up slightly in cost each year. As it takes 5 or 7 days to get a dredge permit through the mail, I advise you to submit your application before you arrive for the project. To have an application sent to you, I suggest you contact: the California Department of Fish and Game, 601 Locust Street, Redding, CA 96001, telephone: (530) 225-2300. Here is an example of how to fill out the form. If you do not want to spend money on a dredging permit, you do not need to obtain one to participate in one of these dredging projects. Your only limitation will be that you cannot operate the dredges’ suction nozzle. But, you will be able to help in every other way. You can still dive down underwater and help the person who is operating the nozzle. You can help us move the gear around, winch boulders out of the way, and do the gold concentration and clean-up. There are plenty of things you can do to help in an active dredging program. These surface mining and dredging projects are a team-building program. This is because we must all work together in a team-effort to recover the most gold possible by the end of the week. The nature of these projects is that they result in being a great adventure for everyone who participates. Since different people have varied abilities (and sometimes disabilities), as well as different levels of endurance and strength, we will need to assess the strengths and weaknesses of each group before planning what we will do and where we will go in search for high-grade gold. Our mission on each project will be to have a careful look at what we have to work with as a team, and then apply ourselves within those limitations to find as much gold as we can in the time allowed to us. 2) Trade the nugget(s) to whoever offers the most for them in smaller gold. The smaller gold can then be evenly split up amongst the participants. We are going to find some amount of gold. That is for sure! But because this is true gold prospecting, I cannot make any guarantees about how much gold we will find. All we can do is invest the week using our best efforts to locate something that is going to add up well. While this takes skill, there is also some luck involved. But, with a good team, it is pretty likely that we will find something to get us excited. My promise: As the project manager, I will employ my many years of experience to try and guide us into something that will make this a rewarding program for everyone. You will be actively involved, because I will bring the team into all of the key decisions, discussing our various options. We will make most of the decisions together, but I will ultimately decide what we will do. Each participant in the project will sign a Joint Venture Agreement before becoming involved in a project. This Agreement will be an acknowledgment from you that you understand that there are risks involved, and that you are qualified and prepared, based upon your own past experiences, to assume the risks upon yourself. You will promise to be extra careful to not do things that you cannot safely accomplish, and will not hold me, The New 49’ers, other project-participants, or anyone else personally responsible in the event of an accident. 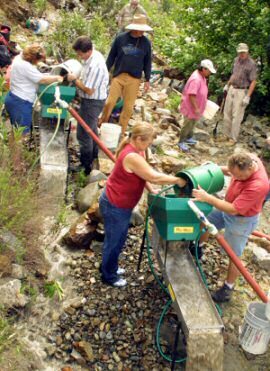 Gold prospecting is a challenging activity. We may find ourselves hiking across uneven, rocky terrain, or we may find ourselves rafting or boating down a fast-moving river. We will be packing heavy gear around and doing a variety of challenging physical activity. You should not come if you are not up to the physical challenges involved with these projects. Because I do not know your limitations, it will be up to you to decide what you can or cannot do. You must agree to stay safely within your own physical limitations. You must let me know what they are. I will not push you to go beyond them, as long as I know what they are. I will find a way for you to contribute within your ability. I will also reserve the right to reject any person (with a full refund of entrance fees) who I do not feel can participate safely in a project. I will also reserve the right to discharge any participant from a project who is either misbehaving, causing safety problems or who is making the experience miserable for other participants in the program. In this case, we will prorate the refund to the unused time of the project, and the gold share to the number of days the person actively participated. For the above water prospecting project: You will need some basic digging tools (shovel and trowel), a gold pan and a #8 classification screen. If you have a vack-mining machine, I suggest you bring it along. All these are available to you in Happy Camp if you don’t already have them. Also, please remember to bring clothing and footwear that you don’t mind getting wet and dirty. For outdoor safety, bring a good sun hat and sunscreen, along with a container for drinking water. I will provide the motorized equipment and boating gear if we use it. For the dredging project, you will need your own wet-suit, face mask, protective gloves, and foot protection. This is all available in Happy Camp should you need to purchase anything. However, I would advise you to call ahead and ask the people in the store to set your size aside for you (530) 493-2012. I will provide the dredging equipment, hookah breathing gear, standard-sized weight belts and gold-concentration equipment. I will also provide the winching gear and boat(s) if we need them. If you are heavy, or your body is not an average size, it is a very good idea that you bring along your own weight belt; something that will stay on you properly when you are underwater. Ear protection is also a good idea for those who will prospect in the water. Some use Swim Ear, which is an over-the-counter solution that helps prevent fresh-water ear infections. A prescription from your doctor for Domboro Actic Solution (Bausch & Lomb Acetic Acid 2% in Aqueous Aluminum Acetate Otic Solution) is even better. I understand that you can now buy Domboro in tablet-form over-the-counter, and mix your own solution. You must be fully responsible for your own belongings. If you plan to bring valuables in the rafts or boats, I suggest you also bring a heavy-duty, waterproof bag to keep the valuables (cameras, money, etc) safe and dry. These group-mining projects are a daytime program. We usually meet at a particular location at around 9:30 am, work together throughout the day, and finish up sometime between 6 and 7 pm. To participate, you must arrange your own transportation to Happy Camp, California, and also arrange your own transport while participating in the project. A two-wheel-drive vehicle is fine. We usually car-pool to and from the work area each day. Sometimes we camp at or near the mining site. You also must provide your own meals and drink. We will each bring our own lunches out into the field with us when we go each morning. You also must provide your own lodging. There are motels around the area. Our office in Happy Camp can assist you to make contact in advance (530-493-2012). I advise you to be a little flexible on your advanced lodging plans, because we will not know where we will end up mining until about the time we begin. This is because if we find out about a hot new gold strike somewhere away from Happy Camp, we may want to go there to get our share of the gold. Also, we cannot fully-decide where we will go until after we size-up the group as a whole. Ultimately, our last minute planning could affect your motel plans or where you ultimately decide to make a camp. Tent or RV camping is fine. We can arrange for a place where you can set up, usually very close to where we will be working. There is no charge for camping out on our mining properties. While these projects have been talked about in the past as training programs, it is important to understand that the primary purpose is to locate and develop high-grade gold deposits in a joint mining venture. Any learning experience from this is incidental to the main purpose. The cost of participation is $600 for a dredging project, and $500 for the above-water project (half-price for participating spouse in either type of project). No children are allowed on these projects. There is a $100 discount for New 49er Affiliate, Associate or Full Members in good standing. This is because New 49’er members are already actively contributing to maintain the properties where we will be mining. It takes a non-refundable, advanced payment of $100 to guarantee a place on a specific project. Please send your advanced payment, along with your name, address, telephone number and email address to: The New 49’ers, P. O. Box 47, Happy Camp, CA 96039 (530) 493-2012. Please include the date of the desired project, and let us know if a spouse will actively participate in the project. It is a good idea to contact us in advance to verbally reserve your preference, pending receipt of your deposit. I have my eye on a number of areas that I have been watching for a long time – places where few others have gone before! The rubber rafts and boats are ready to go. All the equipment is ready. Now, it’s just a matter of us coming together in a group effort to go down and find the rich gold deposits.